We’d love your help. Let us know what’s wrong with this preview of The Mammoth Book of Gaslit Romance by Ekaterina Sedia. A fantastic collection of stories of love and intrigue that focus on the trappings of the popular Victorian era, enlivened with fantastical elements and incorporating some noir and detective pieces, by O. M. Grey, Leanna Renee Hieber, N. K. Jemisin, Eliza Knight, Sarah Prineas, Delia Sherman, Genevieve Valentine and many more. Full list of contributors: Vivian Caethe; Leann A fantastic collection of stories of love and intrigue that focus on the trappings of the popular Victorian era, enlivened with fantastical elements and incorporating some noir and detective pieces, by O. M. Grey, Leanna Renee Hieber, N. K. Jemisin, Eliza Knight, Sarah Prineas, Delia Sherman, Genevieve Valentine and many more. 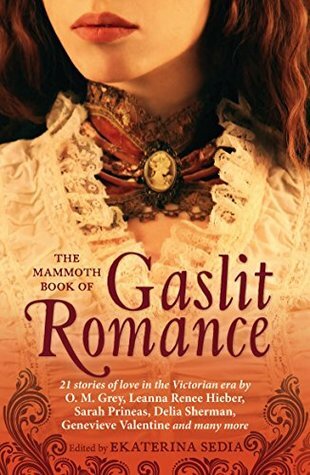 To ask other readers questions about The Mammoth Book of Gaslit Romance, please sign up. Read Tansy's piece in this one and that's it so far - loved it! Unfortunately, this was massively disappointing to me--most of the stories were pedestrian and unengaging and the only 3 that were at all good I had already read in other collections. Ekaterina Sedia is also credited as E. Sedia.